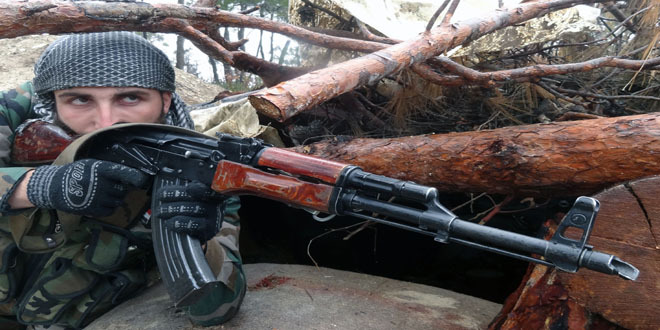 Provinces, SANA – Continued army operations in Aleppo resulted in cutting off a supply route for terrorists in the northern countryside, while army units in other areas targeted more positions, destroying their equipment and killing many of them. Sources on the ground told SANA’s correspondent on Wednesday that Army and Armed Forces units operating in Aleppo’s northern countryside, in cooperation with groups of popular committees, broke the siege imposed on Nubbul and al-Zahra towns by terrorist organizations. ِِArmy units advanced towards Dweir al-Zeitoun,Tal Jbeen and Hardanteen towns to which security and stability were restored on Tuesday. Scores of terrorists were killed, most of them from Jabhat al-Nusra during the operations, some others fled away leaving arms and ammunition, while some of them turned themselves along with their arms to the army and the popular groups. Army units completely cut off supply routes coming from the Turkish territories to terrorists fortified in Mayer town in a new advance leading to more victory. Earlier, army units, in cooperation with popular defense groups, restored security and stability to al-Uwainat village in the eastern countryside of the province inflicting heavy losses on the ISIS terrorists who were positioned in it, a military source told SANA. The source said that engineering units dismantled explosive devices and landmines left behind by them terrorists, most of whom were either killed while the rest fled to nearby areas. Earlier still in the day, a source on the ground told SANA that army units, in cooperation with the backup forces, destroyed vehicles equipped with heavy machine guns belonging to Jabhat al-Nusra terrorists in the surroundings of Maarasta al-Khan village and near Byanoun poultry facility in the northern countryside of Aleppo. Other army units, in cooperation with the popular committees in Nubbul and al-Zahraa towns, completely cut off the terrorists’ supply route between the towns of Mayer town and Maarasta al-Khan. Meanwhile, the terrorist organizations acknowledged on their social media pages the death of a terrorist group’s leader named Omar Qteish and his assistant Abu Hamza al-Halabi, in addition to a leader within “Jaish al-Cham” terror group who is nicknamed Abu Saleh al-Deiri, in addition to acknowledging the death of a military leaders in “Nour Eddin al-Zenki movement” group named Qutaiba Ibrahim Hijazi and Omar Mohammad Jaalouk, and a leader in Jabhat al-Nusra Ibrahim Salloum, along with terrorists Ahmad Atro, Mohammad Hamdo al-Hayyek, and Mohammad Haitham Qanti. Syrian Air Force launched sorties against terrorist organizations in the northern and eastern countryside of Aleppo, killing at least 74 terrorists and destroying 11 of their vehicles. At least 9 terrorists from the so-called “Ajnad al-Sham Islamic Union” were killed in intensive army operations against their dens in Kafr Zita town, 35 km to the north of Hama city. A source on the ground confirmed to SANA that a terrorist leader nicknamed “Abu Omar al-Nasif” was identified among the dead. Meanwhile, army units destroyed a position for terrorists, killing 6 of them, in al-Latamneh town, while another position and a monitoring point for the terrorists were destroyed in Maarakba village, where two terrorists were killed and 7 others were injured. Army operations against positions and gatherings of Jaish al-Fateh terrorists in al-Mansoura village in al-Ghab Plain left 6 terrorists dead and their weapons and ammunition destroyed. 10 civilians were injured in terrorist rocket attacks at different neighborhoods in Aleppo city according to a source in the governorate. The army killed a number of Jabhat al-Nusra terrorists and destroyed their positions in Kisin, Um Sharshouh, Tabeiseh and al-Rastan towns in Homs countryside. 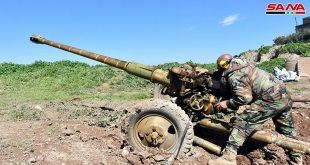 The army also destroyed gatherings for ISIS terrorists in a series of military operations against their positions in Shaer and al-Bayarat in Homs eaterern countryside. The army air Force destroyed three command centers and a number of vehicles with all terrorists onboard in Ataman village in Daraa countryside. Syrian Arab Army units destroyed a bulldozer, hideouts, and concentrations of terrorists from Jabhat al-Nusra and other terror groups at the western side of al-Ghariyat village bridge and at the outskirts of Oum Walad village in the eastern countryside of Daraa province. A military source told SANA that other army units carried out special operations targeting terrorists’ concentrations and movements in Sheikh Hussein hill and Khalif hills in the eastern countryside, killing and injuring members of two terrorist groups in the process. 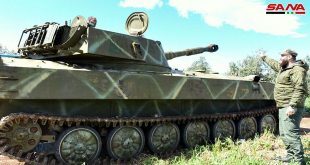 Based on accurate information, an army unit eliminated a concentration of terrorists in al-Yadouda town 5 km northwest of Daraa city.